1. Preheat the oven to 200°C, gas mark 6. Melt the butter in a frying pan over a medium heat and add the shallots. Cook for 5 minutes, then add the chopped fennel and cook for a further 5 minutes. Transfer to a large bowl and allow to cool. 2. Return the pan to a high heat. Add the bacon and cook for 5 minutes. Set aside to cool. 3. Add the cooled bacon and the rest of the ingredients to the shallot mixture. Mix well to combine then season. 4. With damp hands, roll the mixture into 28 balls. Place in a single layer on 1-2 large greased baking trays and bake for 20-25 minutes, until cooked through, the juices run clear and there is no pink meat remaining. 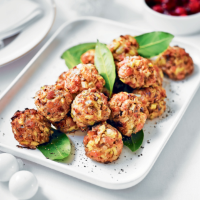 Cook's tipGet ahead: place the rolled stuffing balls on the baking tray, covered, into the freezer for up to 1 month. Defrost thoroughly before cooking.